We use Patient Connect 365 to let you manage your dental care with us online. Pay bills, schedule appointments, securely communicate with us, and more! Estimated co-insurance is due at the time of services. We are happy to file all insurance claims as a service to our patients. PPO participation is limited to Delta Dental and United Concordia. We can give you a general idea of what is typically covered by most dental plans, but we recommend that a “pre-determination of benefits” be filed with your insurance company to provide you with the best estimate of coverages for you and your family. We are happy to file this for you, too. You can pay in full on the day of services with personal check, cash, Visa, MasterCard, Discover or American Express. Interest-free payment plans are available for terms up to 18 months with approved credit. You can make payments online using Patient Connect 365, a FREE service for Optimal Dental patients. Are you a patient of our practice without dental insurance? 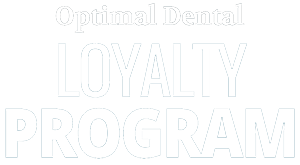 Then join our Loyalty Program, make low monthly payments for your preventive care, and save money today!